So there are a few more pennies in the purse this time round and what a difference this will make. Whilst it’s perfectly possible to get creative with a pound and eat fairly well, it’s always nice to have a bit more cash to play with and you’ll find that with a £2.50 budget for a meal, you can use a wider variety of ingredients and will have a little more choice. Obviously all these ideas are for one serving and they take into account that you will be using just a portion of certain items, for example dried pasta. So, although you might be spending more than the allocated amount on your shopping trip, some of the ingredients will last for two or three meals so the average will be under £2.50 per meal. We’ve come up with a few creative dishes that will come in at under £2.50 per serving and will keep dinnertime exciting. If you shop carefully and look out for special offers, they should work out even cheaper! Canned salmon is a great store cupboard staple and one can will make two portions of this dish. Alternatively, put half the salmon in a bowl in the fridge and use for something else the following day. This easy dish just requires you to fry half an onion in a little olive oil, add a couple of chopped sun-dried tomatoes and stir in half a tub of crème fraiche and half a can of salmon (skin and bones removed). While you’re doing this, bring a large pan of water to the boil and cook your choice of pasta. Add a few broccoli florets to the pan about 8 minutes before the pasta is ready. When it’s cooked, drain well and stir in the sauce – absolutely delicious! Yes you can create a warming, filling meal for under £2.50. Just fry an onion, add half a chopped red chilli and about 150g lamb mince. Cook until browned then stir in a small can of chopped tomatoes and a pinch of chilli flakes, if you like a bit of a kick. 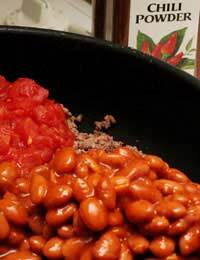 Season well and add a small can of drained and rinsed kidney beans. Allow to bubble for about 15 minutes more, adding a little water if the mixture becomes dry, and serve with rice or pitta bread. Fry half an onion, a chopped garlic clove and half a chopped red pepper in a pan with a little olive oil. Meanwhile, put a measured serving of rinsed rice on to cook. Add a handful of frozen peas and a large handful of cooked, peeled prawns to the other pan, season well with salt and freshly ground black pepper and stir in a handful of freshly chopped parsley. When the rice is cooked, drain well and add the prawn mixture. It’s easy to get creative even when your budget is limited. Shop around and pick out ingredients that you might not normally use – it’s a great way to try new things and push your culinary skills to the limit!